FS Data Review 2019: Is FS Data a Good Hosting? Veteran Swedish company FS Data offers shared hosting plans with a 99.9% availability guarantee and SSL certification. However, questions about performance capabilities undermine the overall value. FS Data is a Swedish web services company that’s been in business since 1997. The web hosting veteran is entirely family-owned and manned by a team of about 20. The company’s facilities and staff are located in Helsingborg, Sweden, and service is provided in Swedish. 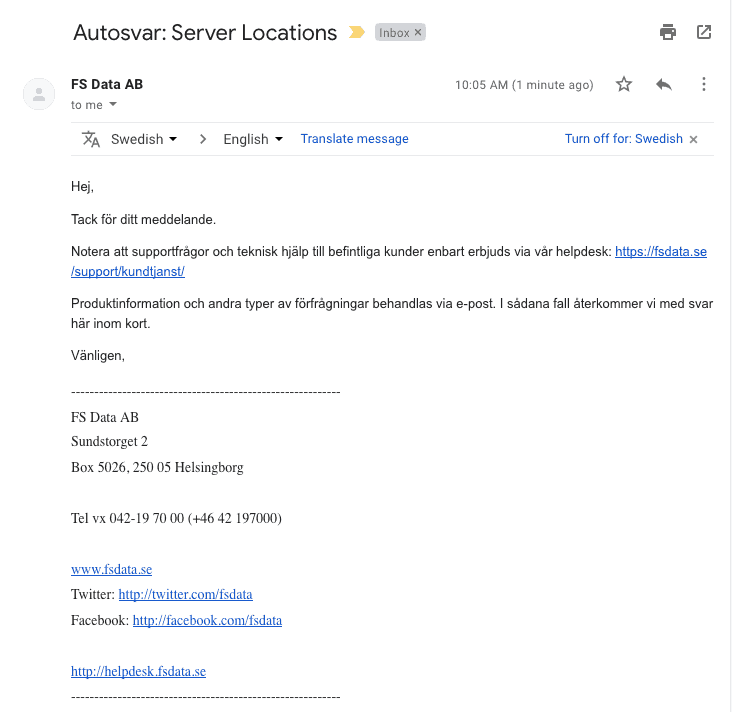 FS Data offers Linux and Windows support and a 99.9% availability SLA (with the option of upgrading to 99.95% availability) on shared hosting plans though Swedish servers. Webmasters with a sizable audience in Scandinavia and Northern Europe will find a home here. One-click integrations are specifically offered for WordPress, Joomla, and Drupal. However, there’s no specific mention of the auto-installer available, and so it’s unclear how many total integrations are available. E-commerce merchants can also take advantage of a free SSL certificate. Daily website backups are provided. Advanced webmasters can take advantage of support for the Perl, Python, and Ruby programming languages. There is a 30-day money back guarantee on all shared hosting and VPS plans. FS Data offers three shared hosting plans. The entry-level “Premium” plan comes with 20GB of disk space and 300GB of traffic, which is a fair amount and more than sufficient for beginning webmasters. You can increase those levels up to 200GB disk space and 3,000GB traffic with the highest-tier “Platinum” plan. The price for the amount of storage and traffic offered is very good in comparison with the competition. However, the SLA doesn’t provide any information on the number of databases available to process all of it. So, while the 99.95% availability guarantee does provide some peace of mind, questions remain about how website performance will be affected if you take advantage of all the capacity provided. There are three VPS plans, which range from one to four CPU cores, 100-400GB disk space, and 1-4GB of memory. They come with HDD standard, but can be upgraded to SSD for an additional 33% to 66% increase in price. The price relative to the competition is average. Support options are below average. For starters, there is no 24/7 support available. And as you can see from the screenshot below, no initial real-time technical support of any kind is available — you must submit requests via the ticketing system and wait for a response. However, phone and remote support options via TeamViewer are available, as well as an extensive knowledge base. FS Data offers a minimum 99.9% availability SLA and a 30-day money back guarantee for all plans. Capacities are good for the price. However, a lack of transparency about databases for shared plans and the need to pay to upgrade VPS plans to SSD is problematic. It’s mostly small and medium-sized websites in Scandinavia and Northern Europe that will find a home here. Wondering how FS Data stacks up against other Web Hosting companies? Enter any other Web Hosting company and we will give you a side-by-side comparison.